If climate disasters are to be averted, atmospheric carbon dioxide (CO2) must be reduced below the levels that already exist today, according to a study published [*.pdf, open access] in Open Atmospheric Science Journal by a group of 10 scientists from the United States, the United Kingdom and France. Reducing atmospheric CO2 levels is only possible by means of carbon sequestration and the production of carbon-negative bioenergy. In practise, the scientists urge us to end coal emissions and at the same time launch bioenergy with carbon sequestration systems, tree planting campaigns, anti-deforestation efforts and biochar initiatives. Ordinary renewables like wind and solar can help, but they do not suffice because they are merely 'carbon-neutral' and are incapable of actively withdrawing CO2 from the atmosphere. The authors, who include two Yale scientists and NASA's Dr James Hansen, assert that to maintain a planet similar to that on which civilization developed, an optimum CO2 level would be less than 350 ppm — a dramatic change from most previous studies, which suggested a danger level for CO2 is likely to be 450 ppm or higher. Atmospheric CO2 is currently 385 parts per million (ppm) and is increasing by about 2 ppm each year from the burning of fossil fuels (coal, oil, and gas) and from the burning of forests. Desire to reduce airborne CO2 raises the question of whether CO2 could be drawn from the air artificially. There are no large-scale technologies for CO2 air capture now, but with strong research and development support and industrial scale pilot projects sustained over decades it may be possible to achieve costs ~$200/tC or perhaps less. At $200/tC, the cost of removing 50 ppm of CO2 is ~$20 trillion. Improved agricultural and forestry practices offer a more natural way to draw down CO2. Deforestation contributed a net emission of 60±30 ppm over the past few hundred years, of which ~20 ppm CO2 remains in the air today. Reforestation could absorb a substantial fraction of the 60±30 ppm net deforestation emission. 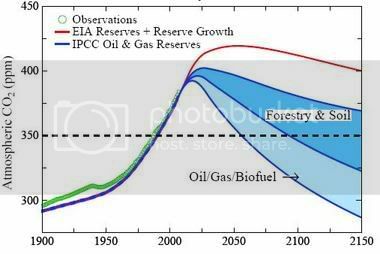 [In the Supplementary Material Section] we define a forest/ soil drawdown scenario that reaches 50 ppm by 2150. This scenario returns CO2 below 350 ppm late this century, after about 100 years above that level. More rapid drawdown could be provided by CO2 capture at power plants fueled by gas and biofuels [that is: carbon-negative bioenergy]. Low-input high-diversity biofuels grown on degraded or marginal lands, with associated biochar production, could accelerate CO2 drawdown, but the nature of a biofuel approach must be carefully designed. A rising price on carbon emissions and payment for carbon sequestration is surely needed to make drawdown of airborne CO2 a reality. A 50 ppm drawdown via agricultural and forestry practices seems plausible. But if most of the CO2 in coal is put into the air, no such “natural” drawdown of CO2 to 350 ppm is feasible. Indeed, if the world continues on a business-as-usual path for even another decade without initiating phase-out of unconstrained coal use, prospects for avoiding a dangerously large, extended overshoot of the 350 ppm level will be dim. Graph: Atmospheric CO2 if coal emissions are phased out linearly between 2010 and 2030, calculated using a version of the Bern carbon cycle model. Credit: Hansen, et al/Open Atmospheric Science Journal. James Hansen, Makiko Sato, Pushker Kharecha, David Beerling, Robert Berner, Valerie Masson-Delmotte, Mark Pagani, Maureen Raymo, Dana L. Royer, James C. Zachos, "Target Atmospheric CO2: Where Should Humanity Aim? ", Open Atmospheric Science Journal, Volume 2, 217-231 (2008), doi: 10.2174/1874282300802010217 [alternative link to the paper]. Please, use the official OAS Journal site, where the paper has a corrected character spacing now. And where the important "Supplementary material" part is availale, too. Jan, there's no direct link to the OASJ paper. That's why we uploaded it to a separate server. I'm sure the reader will consult OASJ if he wants to.